Is summertime summertime without a burger? Debate that this July 4th. I’m sure it’s unanimous that no matter what kind of burger you crave, it’s on your bucket list of must haves this sunny season. Embrace your love for burgerliciousness as you pursue your healthy ways. Try your favorite burger the Lara Metz Nurition way, and you’ll get the best of both worlds: the flavor you crave without derailing your hard nutrition work. Burgers are all about flavor and texture, so use this building block approach to stacking the perfectly grilled creation you’ll adore. While the burger may be the star of the show, the bun can be anything but healthful, or let’s face it, even delicious. Rarely do you find an amazing burger bun that perfectly complements what’s inside. Traditional burger buns are also traditionally nutrient poor, loaded with low quality calories and even detract from the flavor. Bun wisely! 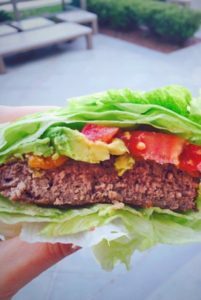 Slip your burger into a lettuce wrap, cabbage roll-up, portabella mushrooms or high fiber, whole grain bakery version. Tip: Commercial buns have their place. The Vermont Bread Company and Alpine Valley make buns with clean ingredients and legitimate fiber to keep you satisfied and they toast beautifully. There’s nothing sadder than a burger with condiments and nothing else going on. A burger is a blank canvas, screaming for lettuce, tomato, onions, and pickles. Oh, and it is also an opportunity to load up on sautéed mushrooms, pickled peppers and onions, sautéed peppers and onions, avocado slices and mash, paper thin zucchini, sprouts, jalapenos, broccoli slaw, kimchi, radishes, and anything else your imagination can conjure. The veggies offer water volume, vitamins, minerals, antioxidants and tons of flavor. Don’t skimp. Actually, if you want to ditch the bun and drop your burger on a salad, you’re eating a true LMN burger. Tip: Want the bun, but watching your starches? Snag half a bun and use a giant lettuce leaf as the top bun. Make the protein in your burger the star of the show. If you like a traditional beef burger, choose grass fed or organic beef to work with for the best quality, nutrition and flavor. If turkey or chicken is your thing, go for 85% lean and look for organic. Salmon, tuna and mahi burgers are delicious and they’re easy to find in the freezer section (thanks Trader Joe’s and Whole Foods) or farmer’s market (the best choice). Veggie burgers can also satisfy, and Hilary’s and Dr. Praeger’s stand up to the grill without junky fillers. Tip: Don’t waste your time on a low quality burger. Spend a little extra time and money on quality – you are what you eat! If you really want to impress, shape, store and set yourself up with burgermolds that make clean up a breeze! Say YES to a spoonful of tzatziki, tahini, avocado, homemade mayo or guacamole. Fats will keep you satisfied and they’re loaded with vitamins and the creamy mouth-feel will release happy feel good hormones. Tip: If you’re up on the latest news, you know that science now says eating fat doesn’t make you fat. Keep in mind that fats should be portion controlled, so don’t go crazy. A little goes a long way! Your burger should be a piece of art. Top it artistically and deliberately with mustard, pickles, relish, sriracha, salsa, ketchup or a splash of hot sauce. Most condiments are “free” foods and don’t contribute much nutritionally to your meal, but you’d be surprised how many are loaded with fillers, high fructose corn syrup or dyes and colors. Check the ingredients to make sure you’re getting the cleanest option you can find. Tip: The most underrated condiment out there are fresh herbs. Top your burger with dill, basil or parsley. YUM!